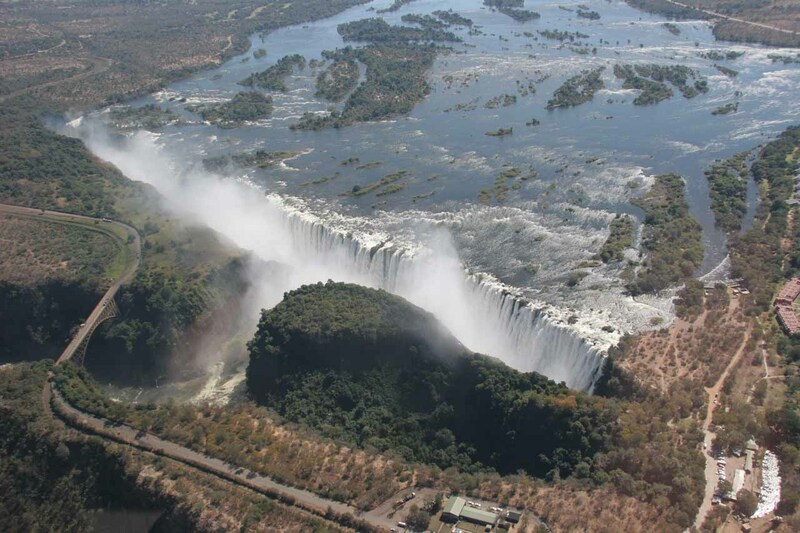 Victoria Falls is possibly the largest singular waterfall in the world. 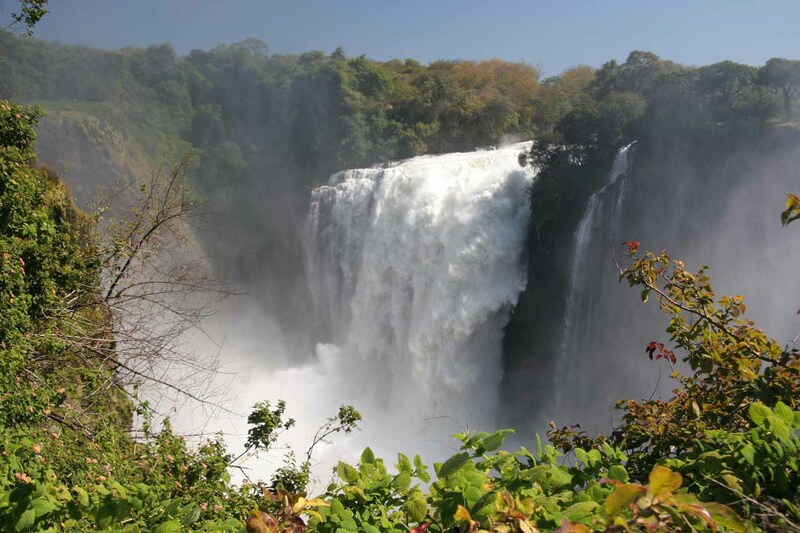 The falls was also known as Mosi-oa-Tunya, which translates to “the smoke that thunders” in the language of the Kololo Tribe, who were present in the 1800s. 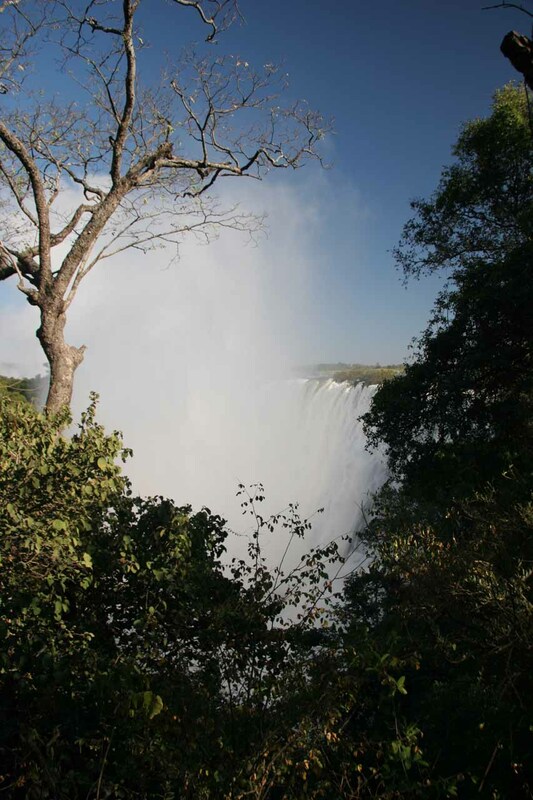 Later, David Livingstone, the first European to see the falls, named it in honor of Queen Victoria in 1855. 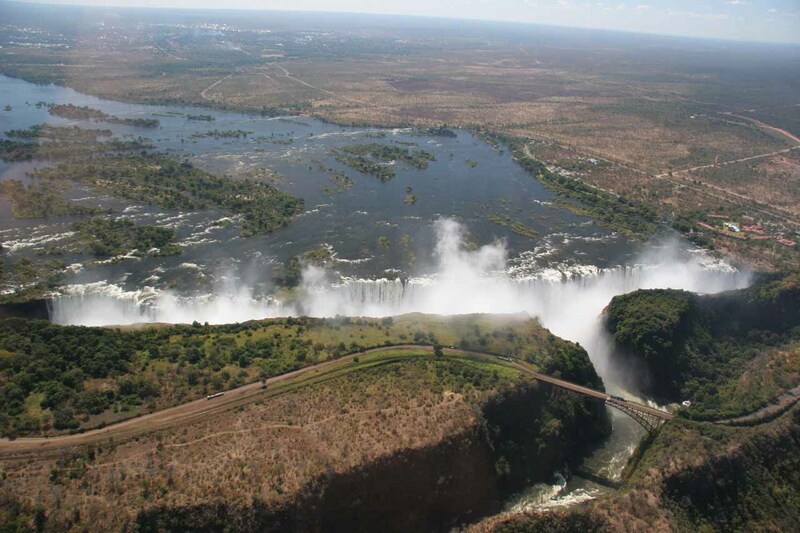 So awestruck was he upon seeing the falls that he described the falls saying “scenes so lovely must have been gazed upon by angels in their flight.” Sometimes I wonder if Livingstone meant the kind of view seen in the photograph above. 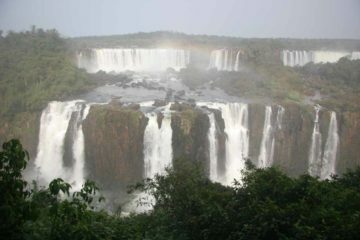 This waterfall is what Julie and I consider one of the “Big Three” (the other two being Iguazu Falls and Niagara Falls). These are the only waterfalls of such size left standing in the world. 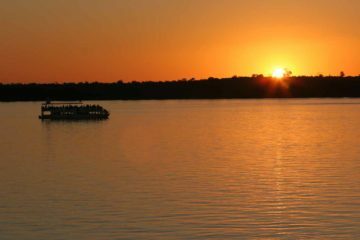 There may have been others through earth’s history, but they’re either sacrificed by damming or diversion, or they may have been casualties of changes in geology and climate. 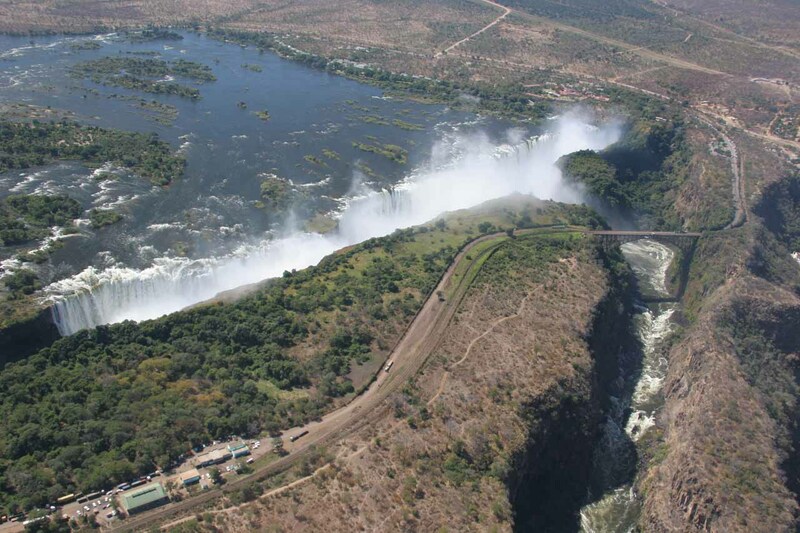 Speaking of grandeur, Victoria Falls is a UNESCO World Heritage site as it boasts some mind boggling dimensions. 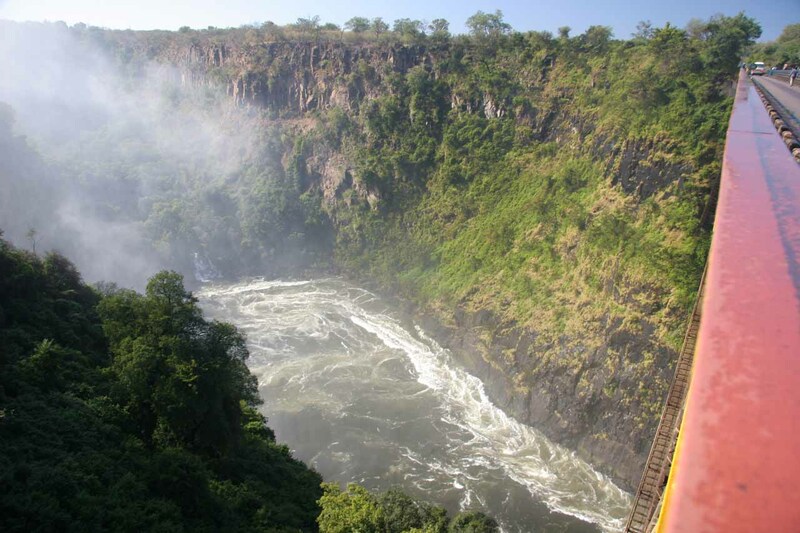 The falls itself is basically where the mighty Zambezi River drops its entire width (about 1.7km across or just over a mile) over a 108m vertical wall into a narrow gorge. 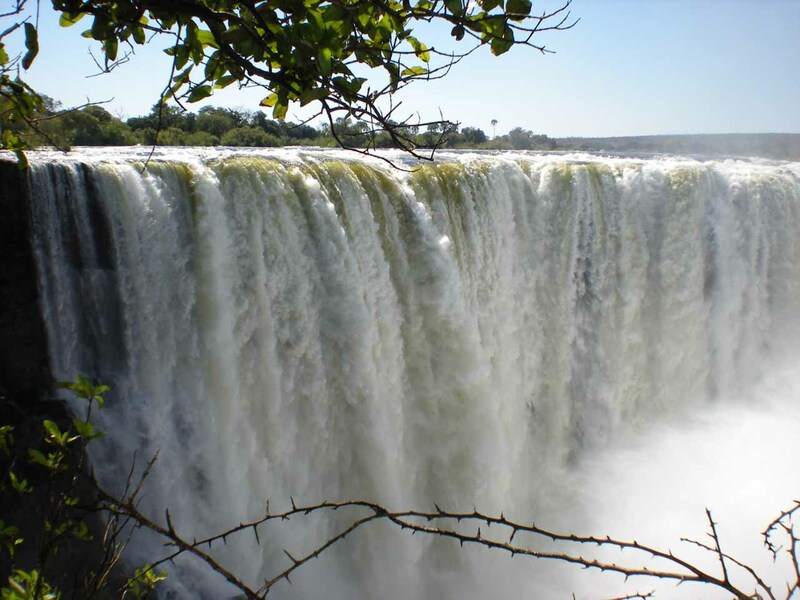 The volume of water over the falls typically ranges between 300-3,000 cubic meters per second. 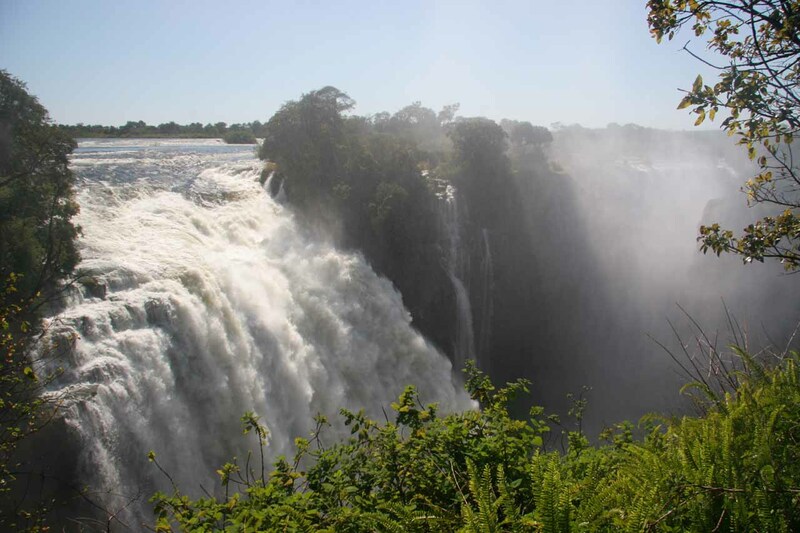 The annual mean volume is said to be just over 1,000 cubic meters per second or 38,000 cubic feet per second or 1 million liters per second. 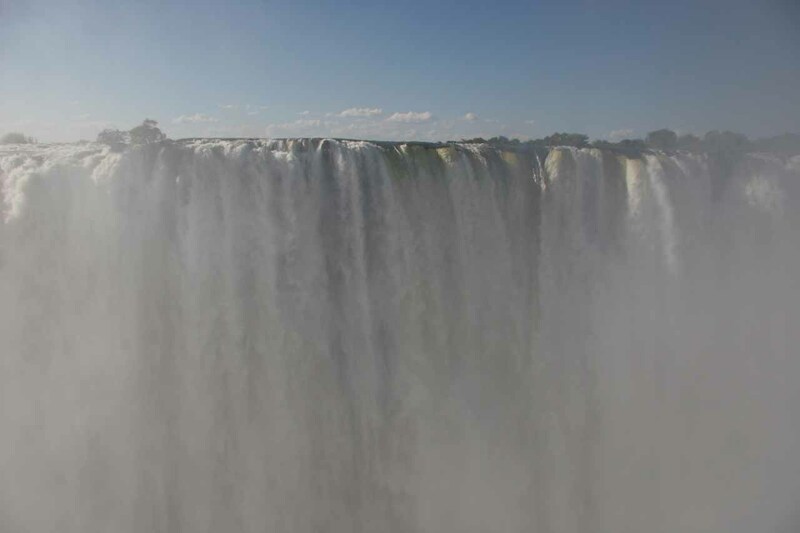 Mist generated by the falls can be seen and felt from several kilometers away, and we could attest to that fact because we were able to see the mist from as far away as Livingstone (Zambia), which was some 11km from the falls. 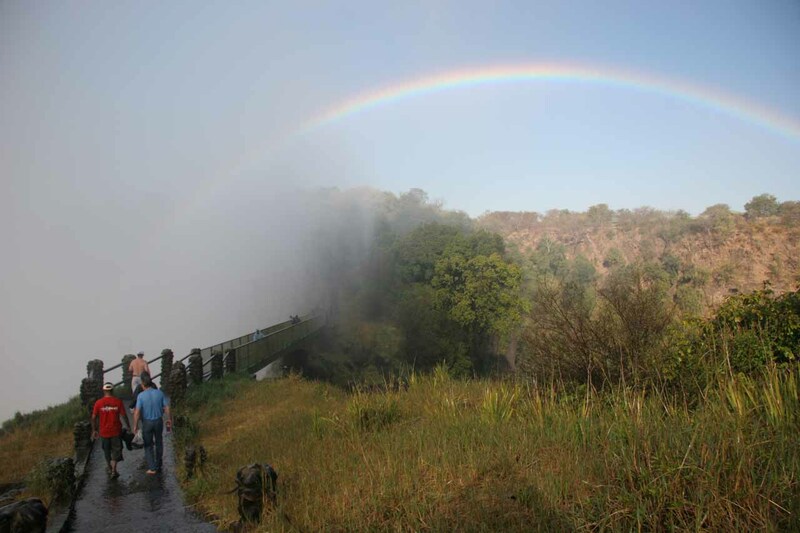 When we toured the falls, we were even able to feel the mist further downstream from it at the Livingstone Memorial Bridge, which spanned the river between the border posts of both Zambia and Zimbabwe. 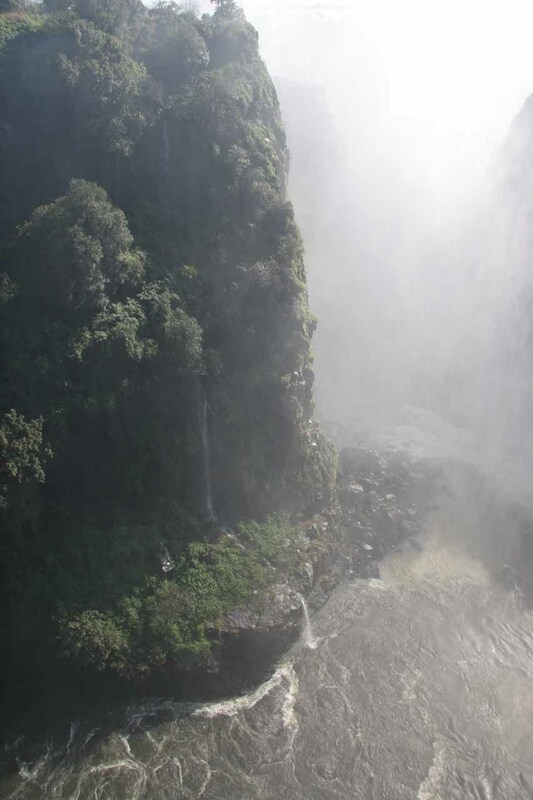 Since the falls plunges into a narrow gorge, all the walkways and viewpoints (with the exception of Livingstone Island) are across the misty chasm directly opposite the falls. 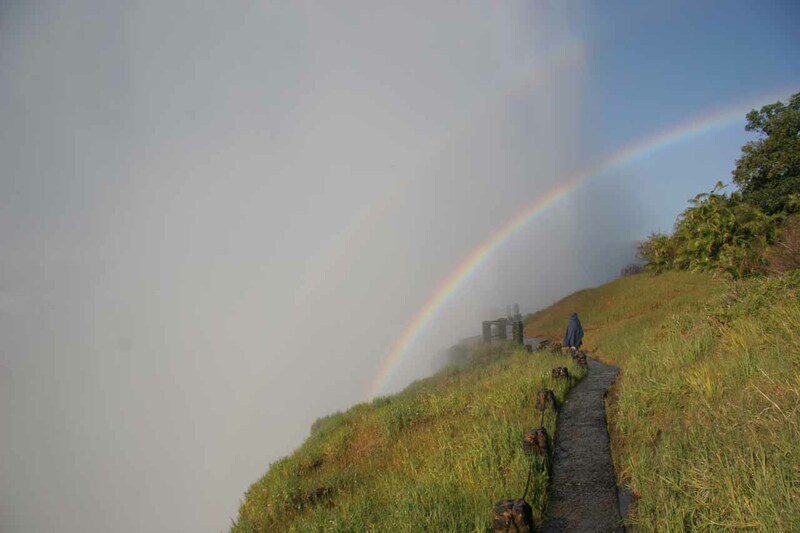 This creates a situation where in high flow (which was the case in our visit), the mist from the falls has nowhere to go but up and rises well higher than the lookouts. Then, the rising mist eventually falls back to the ground creating a virtual nonstop downpour. This was what made wearing a poncho a must in order to prevent our clothing, ourselves, and most importantly our cameras and other electronics from getting drenched. This high flow also meant that we weren’t able to get any all-encompassing view of the falls or even sections of it from the ground (though even in benign conditions, I wondered whether you’d still be able to see a good portion of the falls anyways given its immense scale). So given the conditions, we had to take to the air to really appreciate the whole thing and communicate it through pictures (see the photo at the top of this page). 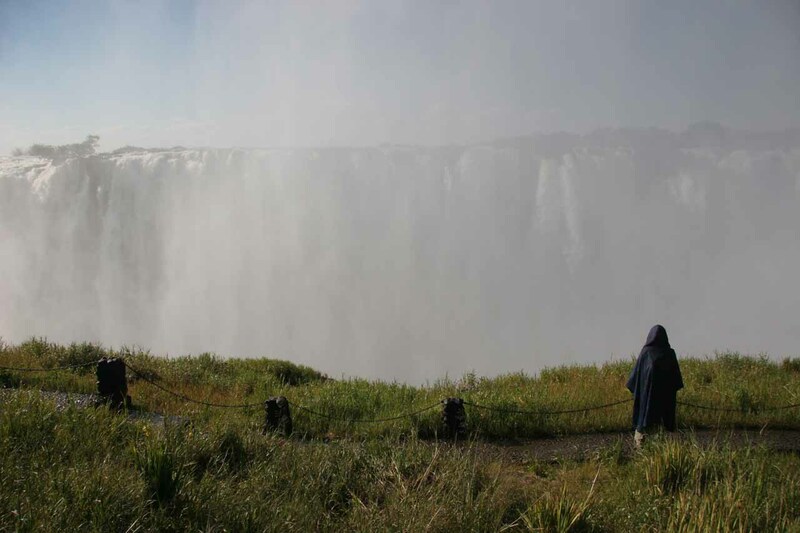 When conditions permit (it wasn’t for us), Livingstone Island (the island where David Livingstone first gazed upon Vic Falls) allows onlookers a different edge-of-the-world view of the falls. There’s even a Devil’s Pool where it’s said that you could cheat death and literally swim right on the edge of the 108m drop! 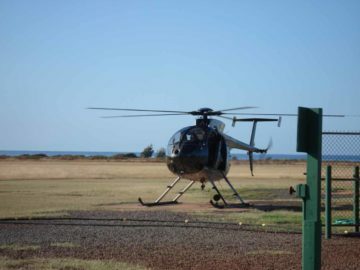 You can read about some of the activities that we’re aware are available here, including those we partook in like the aerial tour and the sunset cruise. Since the Zambezi River marked the political boundary between the two countries, this had some ramifications in terms of us wanting to visit the falls in both countries. 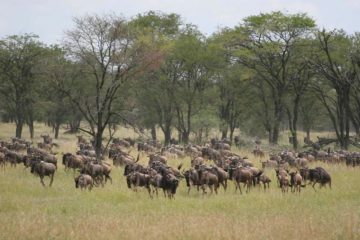 We did a writeup discussing the less glamorous logistics of our trip (including some of the paperwork and fees we had to go through in addition to other things to plan and prepare for our visit), which you can about here. 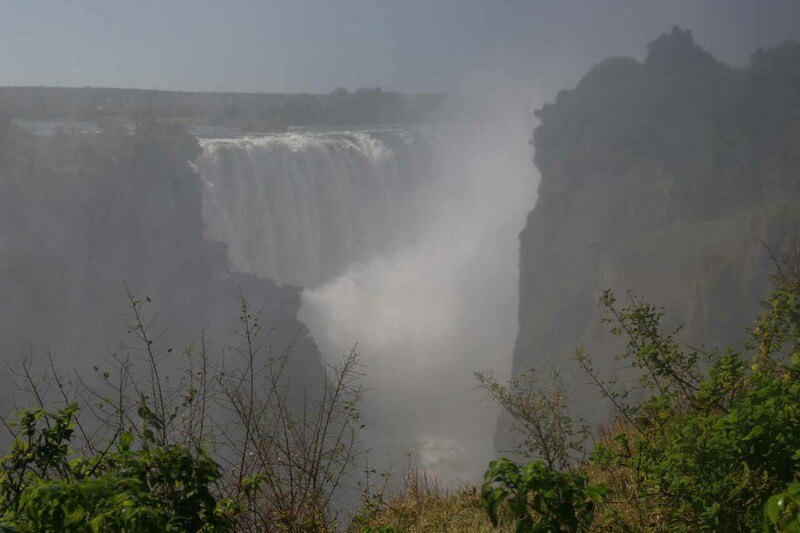 As a result of our experience and observations at Victoria Falls, we were quickly made aware that the type of experience you might get at the falls heavily depends on timing. Come (as we did) at a time when the Zambezi River is in high flow and nearly all viewpoints become a misty mess obscuring views and drenching onlookers. Though the falls may be the most impressive at this time, we found the photography and the viewing experience in general from the ground a bit difficult. Come at a time when the Zambezi River would be in low flow and the falls would segment into several smaller, narrower waterfalls exposing the immense wall underneath. 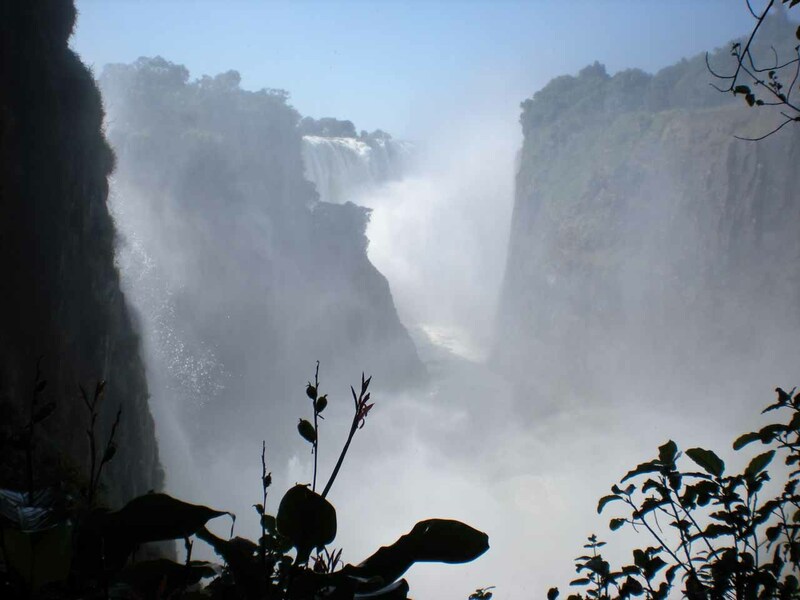 This would be the time when I’d imagine more activities concerning the falls become available though the magnitude and visual impact might be dimished. If we’re fortunate to come back, I would love to return when we could get the best of both worlds. When that time would be depends on various seasonal factors. We did a writeup discussing those factors, which you can get into by clicking here. 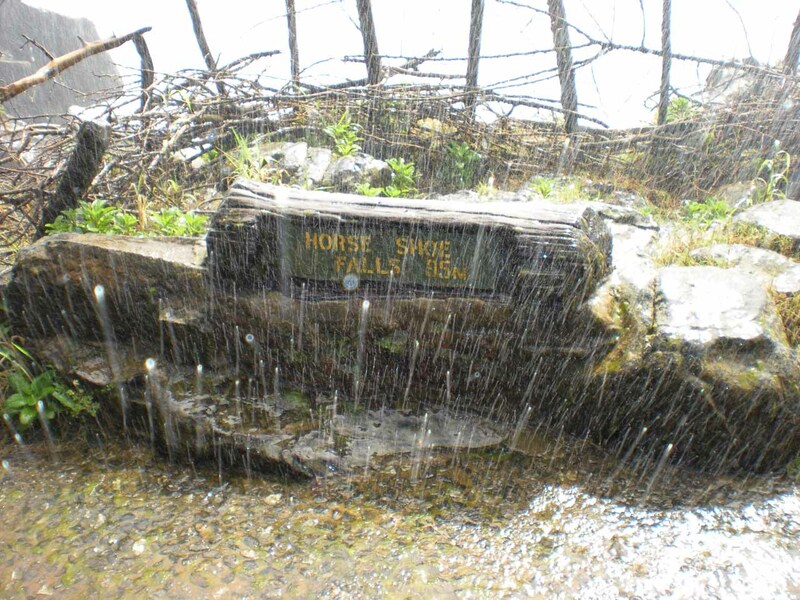 Like all waterfalls, the water’s flow recedes the underlying layer of rock making it “move” upstream over time. 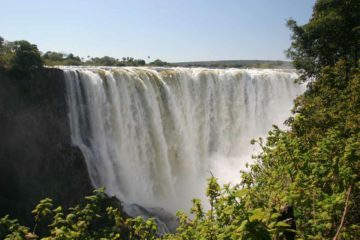 What makes Victoria Falls unusual and different from other waterfalls (like Niagara and Iguazu) is that instead of moving continuously upstream over time, this waterfall creates cracks in its underlying basalt wall at a different angle than the cliff responsible for the current state of the falls. 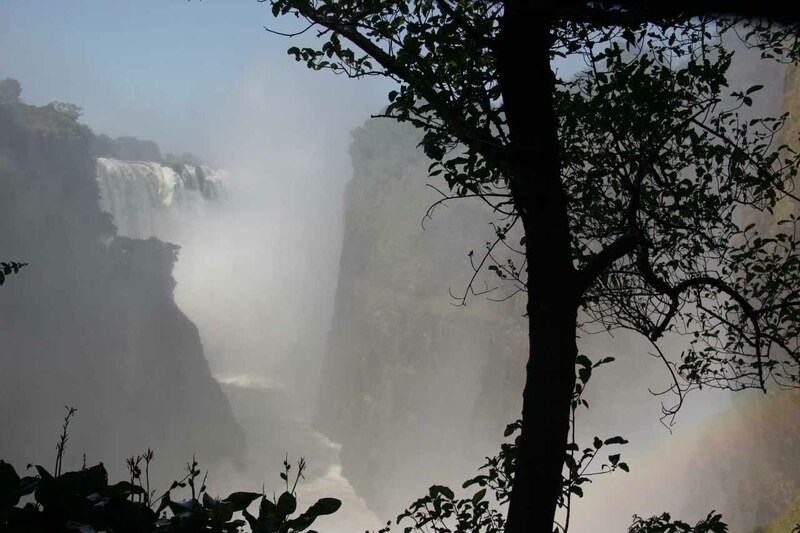 That angled crack eventually forms a new chasm intercepting the flow of the Zambezi River (becoming the new brink of the falls) and leaving the remaining knife-like cliff that once supported the edge of the falls bare and exposed. Over time, the result is a series of gorges (currently there’s said to be some 6 or 7 of them with the oldest ones being furthest downstream) zig-zagging up to the falls’ current position. 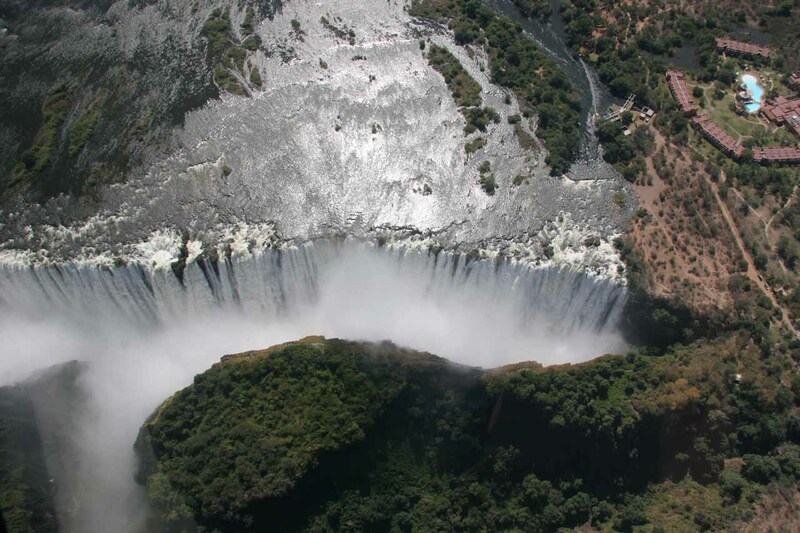 This process is still ongoing as a new crack has started to form on the Zimbabwe (western) side near the section known as the Devil’s Cataract. 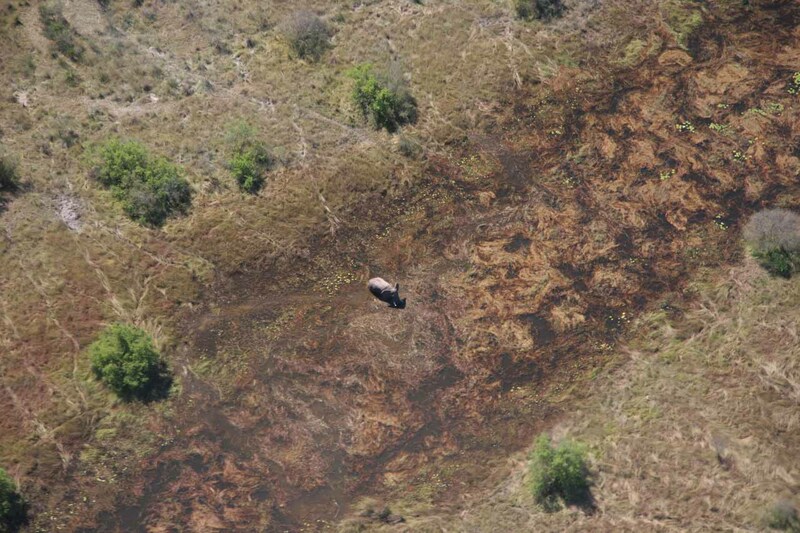 This really didn’t become apparent to us until I reviewed our aerial photos. 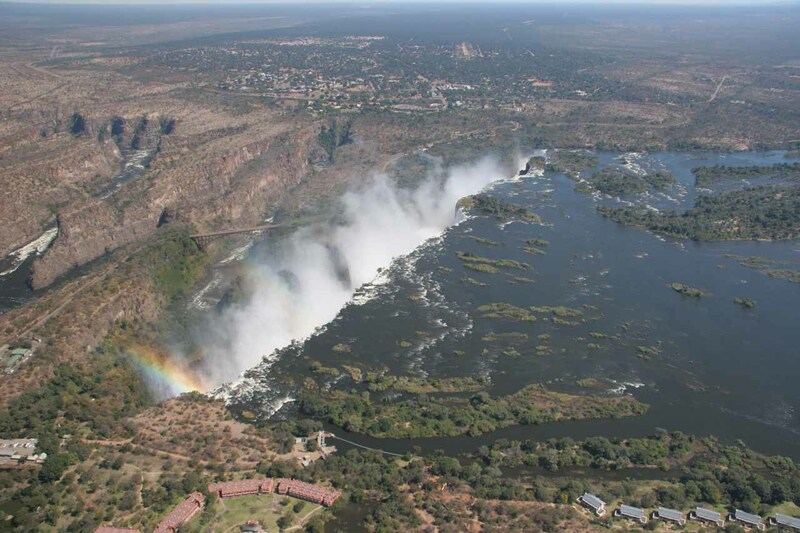 Finally, like its other Big 3 counterparts, Victoria Falls has named sections such as the just mentioned Devil’s Cataract, the Main Falls, Horseshoe Falls, and Rainbow Falls (among others). 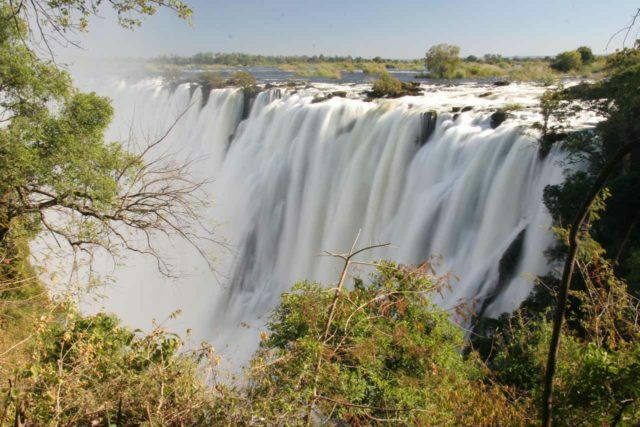 The named sections are typically segmented or partitioned by islands above the brink of the falls (namely Cataract Island and Livingstone Island). 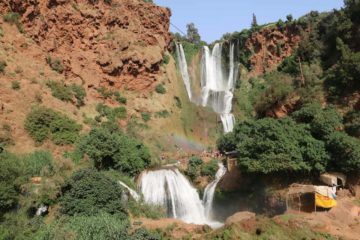 However, we observed that these named waterfalls blended together (especially since it was during high flow) into a singular wall of water. I’m pretty sure the average visitor may not even be able to tell let alone care about which section is which (despite the help of signs). 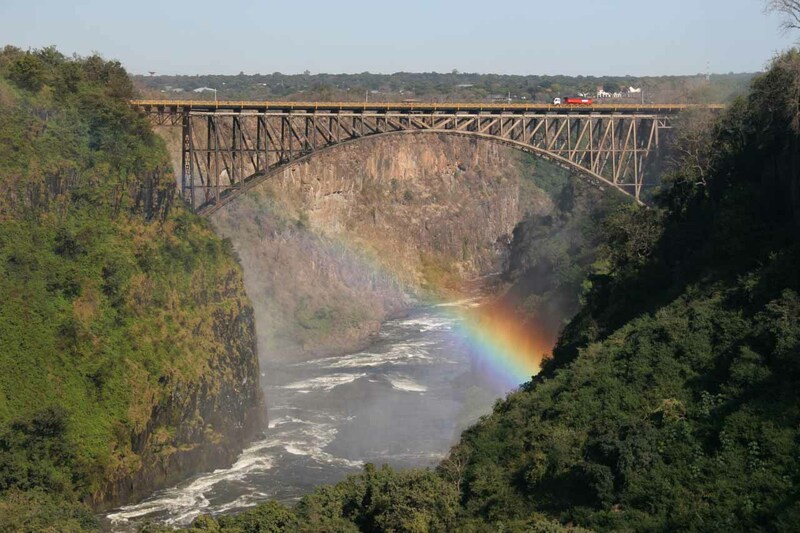 While I can go on and on about various aspects of Victoria Falls, perhaps photos have more impact. So without further adieu, check out the photos below to see more of this world wonder. 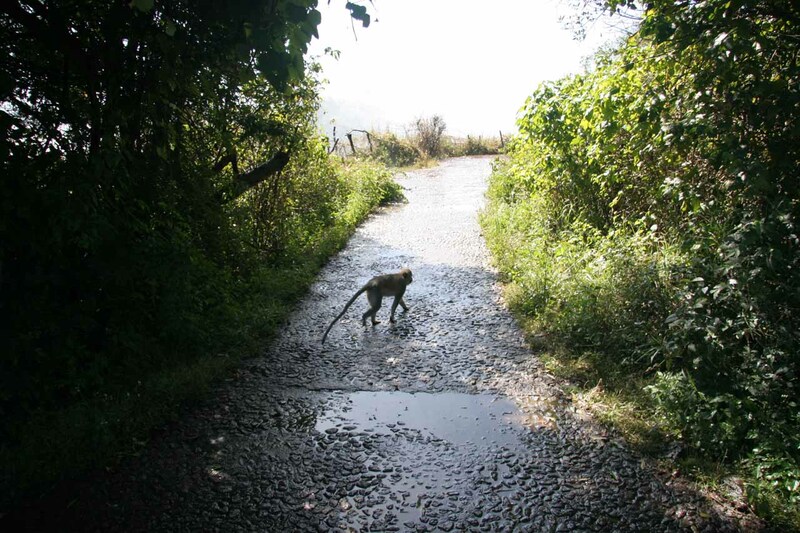 There are many ways of getting to Victoria Falls. 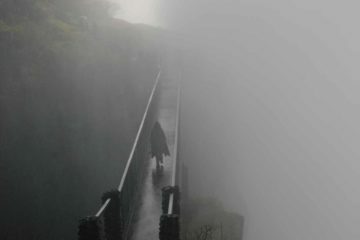 If you’re interested in reading about our accounts of how we managed to get to the falls, you can read about it in this writeup by clicking here. 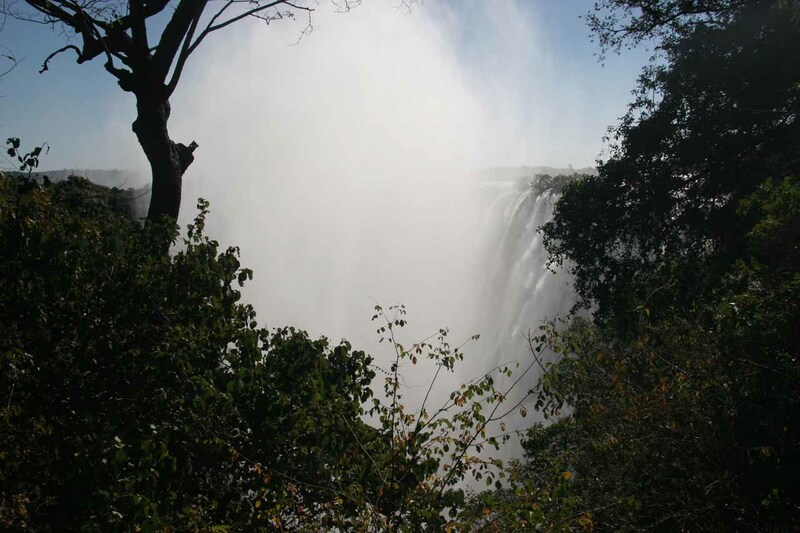 And as alluded to earlier, for foreign visitors like us, we also wrote up a guide detailing the logistics of how we managed to handle some of the less glamorous aspects of enabling a visit to the falls such as Visas, money changing, etc., which you can read about here. 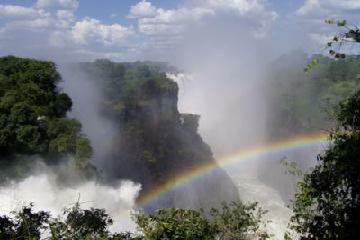 As for geographical context, Victoria Falls sat between the towns of Victoria Falls, Zimbabwe and Livingstone, Zambia. 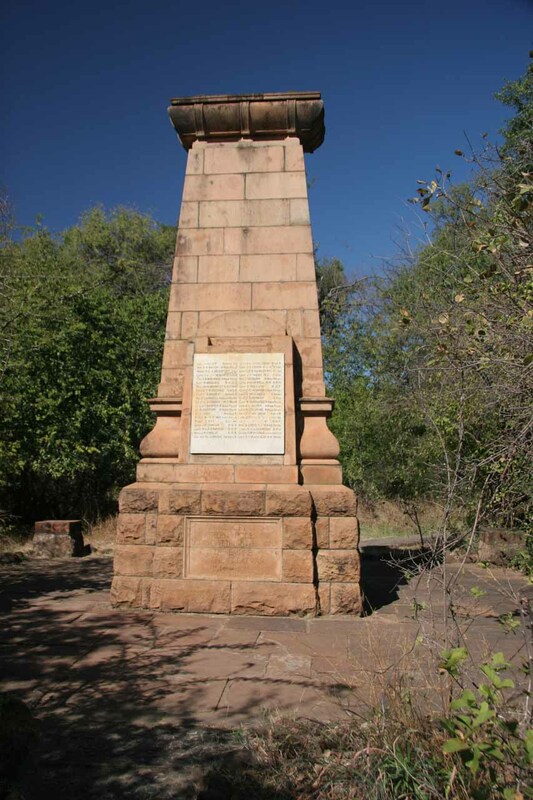 We managed to fly to Livingstone after a two-hour flight from Johannesburg, South Africa. 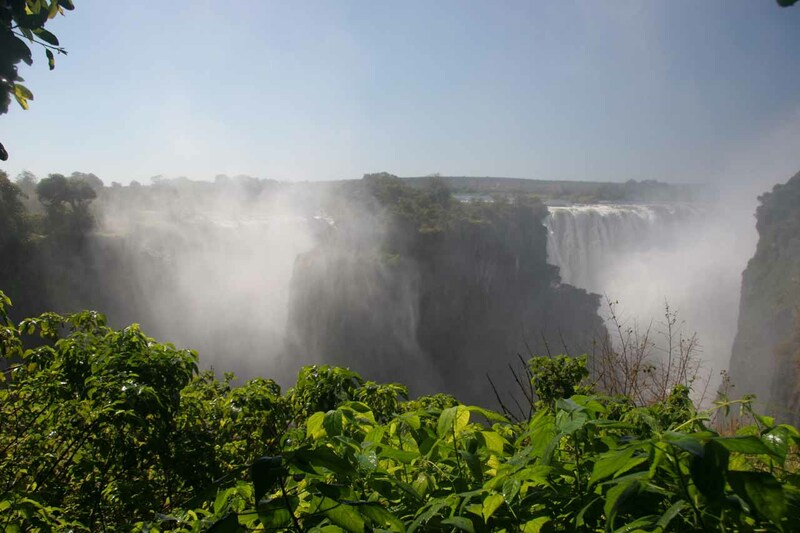 Victoria Falls: When Is The Best Time To Visit? 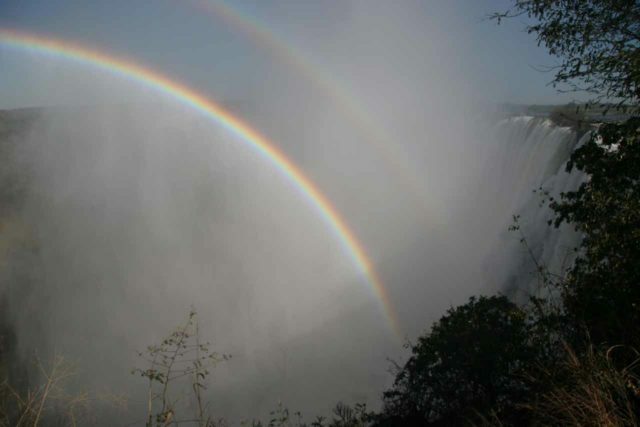 Victoria Falls: Which Side is Better? Victoria Falls: How To Get There?